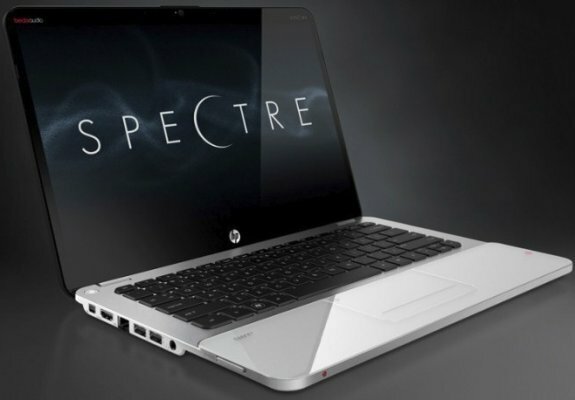 HP showcases the ENVY 14 Spectre, a premium ultrabook with a glass design. It will ship on February 8 with prices starting at $1,399.99. HP today revealed the HP ENVY 14 Spectre, a premium consumer Ultrabook PC that commands attention with its unparalleled use of glass and stunning performance. Equipped with a matching audio-grade speaker mesh and Beats Audio, an exclusive, high-performance technology developed by HP and Beats by Dr. Dre, the HP Spectre boasts an aluminum analog volume dial that acts as a visual design cue and works seamlessly with Beats Audio Manager to precisely adjust audio levels. Built-in HP Wireless Audio turns any home into a concert hall, allowing users to stream uncompressed audio to up to four external devices or directly to any KleerNet-compatible device. Powered by the latest Intel Core processors, the 20-mm-thin HP Spectre weighs less than 4 pounds and includes up to 256 gigabytes (GB) of storage. Intel Rapid Start Technology and support for two ultrafast mSATA solid state drives allow for quick boot and resume times. Additionally, the Spectre offers a performance-tuned software image, full versions of Adobe Photoshop and Premiere Elements, two years of preinstalled Norton Internet Security and a concierge phone line for technical support that is dedicated exclusively to HP ENVY users.